Synopsis: The discovery of a bone and a gun send a husband and wife on separate adventures over the course of a weekend. It’s amazing how a movie that ostensibly seems to be about nothing can, in afterthought, be a very deep and meaningful experience. That’s the kind of movie that director Joe Swanberg (Drinking Buddies) has made with Digging for Fire. 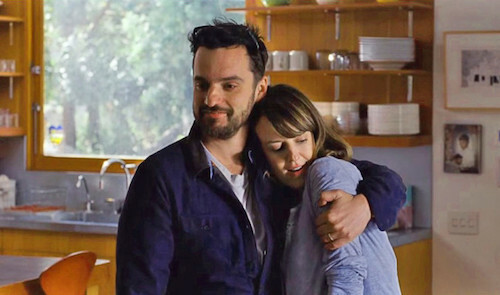 Digging for Fire is about a fragilely married couple named Tim (Jurassic World‘s Jake Johnson) and Lee (Rosemarie DeWitt from Poltergeist and Promised Land) who temporarily move into a beautiful home on a suburban hillside. While playfully digging in the back yard, Tim finds an old gun and a piece of a bone. Tim is excited by the mystery, but Lee wants nothing to do with it, afraid of what else they might find if they continue to dig. Craving a night out, Lee drops the couple’s son off at her parents’ house for the night while she makes plans to visit with a friend, leaving Tim at home to do their taxes. However, as soon as she leaves, Tim invites his buddies over, and they invite their buddies, and soon enough, Tim is hosting a party. Conversation turns to the gun and bone, and of course, the drunken crew ends up digging for more on the hill, pulling up more mysterious artifacts like shoes and license plates. As the night goes on, Tim finds himself inexplicably drawn to one of the party crashers, a free-spirited girl named Max (Short Term 12‘s Brie Larson). Meanwhile, Lee goes out to a bar and meets a young man named Ben (Orlando Bloom from the Pirates of the Caribbean movies), casting doubts of her own on her feelings for Tim. Over the course of their time apart, both Tim and Lee end up questioning the strength of their marriage. Joe Swanberg makes it look so easy. He gets an idea, comes up a script that is probably more of an outline, gathers up a bunch of pals, and makes a freaking movie. That seems to be what he did with Drinking Buddies, Happy Christmas, 24 Exposures, pretty much all of his movies – and it’s what he has done with Digging for Fire. Writing credit on Digging for Fire is shared with Jake Johnson (who plays Tim in the film), but again, the movie has such a loose and easy feel that it seems as if the script is more of a guideline than a strict screenplay. The cast is loaded with Swanberg’s talented pals, stars like Anna Kendrick (The Last Five Years), Sam Rockwell (Laggies), and Ron Livingston (The Conjuring). Even Lee’s parents are played by Judith Light (“Who’s the Boss?”) and Sam Elliot (I’ll See You in My Dreams). So, the smartest thing he can do is set them up and just let them go. And because of that, Digging for Fire is raw, honest, and genuine, hitting all of the colors of the emotional spectrum, from humor to heartbreak and all points in between. Really, the digging in Digging for Fire is a red herring; none of it goes anywhere, and the mystery of the unearthed artifacts is never satisfactorily solved. But that’s okay, because that’s not the main idea of the film anyway. The audience’s focus should be on Tim’s and Lee’s relationship, the secrets they keep and the desire to learn those secrets, as well as the needles-and-pins statuses of their own feelings. Not bad for a “mumblecore” movie about absolutely nothing. Typical of Joe Swanberg and his “mumblecore” style, Digging for Fire simultaneously gives the impression of being both improvised and heavily scripted. The conversations and dialogue are very loose and free-form, but the overall plot arc is meticulously planned out, almost as if Swanberg provided the actors with a strict outline of what needs to happen in each scene, yet gave them to freedom to decide how to get there. The film is rife with symbolism and metaphor, with the hill representing Tim and Lee’s marriage and the digging standing in for curiosity and temptation. The morning after Tim’s party, a neighbor named Tom (Tom Bower from Out of the Furnace) visits and inquires about the digging, warning Tim against the “spirits” on the hill, telling him “you don’t wanna find anything down there – believe me.” The statement gives the impression that Tom, a rough old guy who looks like he would have ties to organized crime, knows something about the hill, but in reality, he knows something about women and relationships. The line hints towards a plot point that never pays off, yet provides a ton of after-the-fact analogy once the events of the film play out. With Digging for Fire, Joe Swanberg proves that even a well-crafted and thought out movie can have a loose and natural improvisational quality.